Santa Fe is a fabulous place full of history, wonderful architecture and great food. 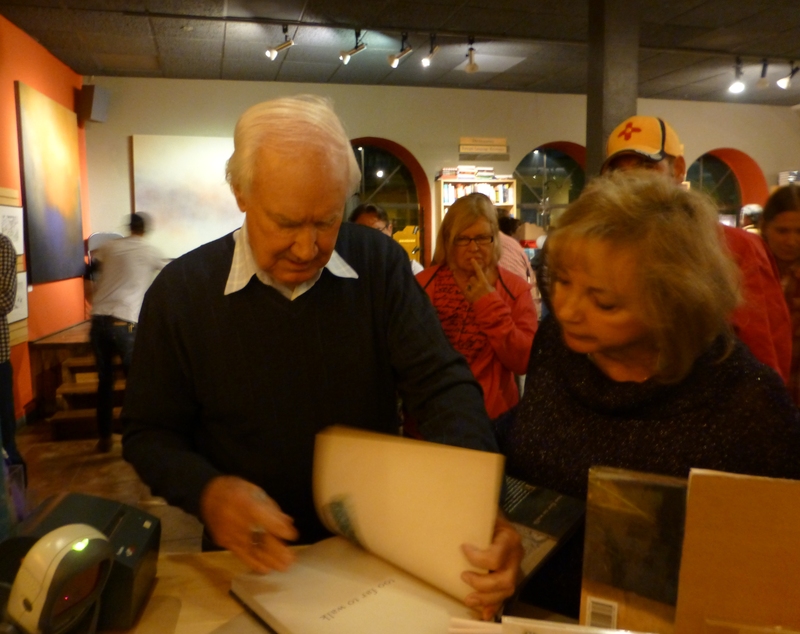 On top of all that, my husband and I attended Forrest Fenn’s book signing. We drove ten hours from Las Vegas to get there! He was joined by his two cohorts and famous authors, Douglas Preston and Michael McGarrity. What a trio they made joking and chiding each other. There were about 15 or so treasure hunters there, among the 50 or so guests, and Forrest gave us a few more clues, in his usual style, that were no help at all! He looked terrific and his family was there, including his grandson who introduced the trio. Forrest has an amazing wit and kept the other two on their toes for sure. Although he said no one may not find the treasure for a hundred years or more, I do hope one of the hunters finds it in Forrest’s’ life time, so he can enjoy and partake of all the hullaballoo it will cause. Douglas and Michael have both seen the treasure and described it as stunning. Good to know it is real and out there somewhere. Although the new “clues” were not really helpful, they were encouraging. I now know to limit where I look to places where I think Forrest might have been able to get to easily. And, after talking with a few other chasers, I know that we all think we know where it is. It is also helpful to know some of us have been very close! While we were in Santa Fe, we looked around a bit. There is a street called Canyon. We also took in some of the more famous sites around. The Bandelier National Monument was spectacular and the Taos Pueblo was the most interesting thing we saw. Just talking with the local Indians was a pleasure not everyone gets to experience. So, we did not see the blaze nor did we decipher what or where the house of Brown was, at least in New Mexico, but we had a marvelous time in Santa Fe and at the book signing. Sounds and looks like fun! I’ve yet to go to a signing, might see who is going to be at waterstones in the coming year, see what it is all about! I have been to several book signings and they are always interesting, not just because of the author, but also because of the people you meet there! There is always a smattering of different souls!